Fish friendly crossings are waterway crossings which are designed to minimise impacts on native fish. Waterway crossings such as bridges, roads, causeways, and culverts provide access for road vehicles, rail, pedestrians and stock movement. However, such structures can impact on the free passage of fish if they are not designed to cater for migrating fish. Just as waterways vary in their size and shape, so too do waterway crossings. Not surprisingly, the potential impact of these crossings on fish passage can vary as much as the structures themselves. Even ‘fish friendly’ crossings can impact on fish, therefore a primary objective of strategic planning should be to minimise the number of crossings. All new crossings should be designed to minimise impacts on fish. In addition, existing crossings should be removed or rehabilitated to allow fish passage. 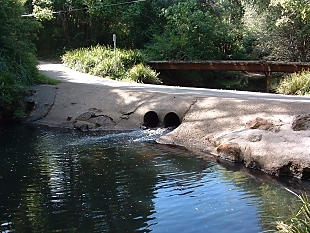 Two examples of road crossings with poor fish passage for migrating fish. 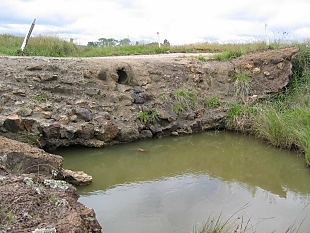 Several projects have established partnerships with local councils to create databases of problem causeways and road crossings that are barriers to fish passage. A number of demonstration projects are also underway to highlight best practice techniques in remediation of road crossings to improve fish passage. These project have been funded by the NSW Environmental Trust and various former Catchment Management Authorities, including Northern Rivers, Southern Rivers, Namoi, Hunter Central Rivers and Hawkesbury Nepean CMAs (now Local Land Services).